Joan Jonas is a true original whose approach to art has had a groundbreaking impact on the world of video and performance. Her multimedia approach also includes props, scripts, sets, costumes, sound, music, choreography, drawing and installation. Her work retells fairy tales and myths from a fresh perspective, creating emotional and visual landscapes which tune into our subconscious experience of the world. I rehearsed my work only at night, and when I rehearsed, I stepped into another space that was not the same as my everyday space. You could almost call it a séance. This otherworldly quality comes through in her often ritualistic performances, which are inspired by a number of different cultures. A collage of sound, visuals and emotions, Jonas’s work provides a multitude of viewpoints on our world, our history and humankind. Joan Jonas, Organic Honey's Visual Telephathy, Castelli, NY, 1973. 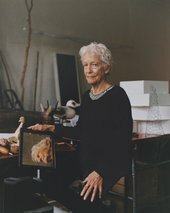 © Gianfranco Gorgoni © Joan Jonas : Artists Rights Society (ARS), New York : DACS, London. 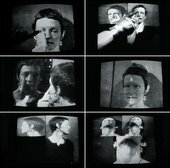 Joan Jonas, Delay Delay, 1972, performance, Lower West Side, New York, NY, 1972. 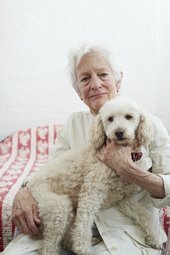 © Gianfranco Gorgoni © Joan Jonas : Artists Rights Society (ARS), New York : DACS, London. I was immediately attracted by the possibility of a form in which I could employ or layer all disciplines. This ‘form’ was mix of video and performance which allowed her to bring together music, dance, sculpture, costume design, and installation in a way that had never been seen before. Her relationship with video started in 1970 when she took a trip to Japan and purchased her first portable video camera, a Portapak. Upon returning to New York, she experimented with video, discovering a new world of possibilities, made all the more appealing by its handheld nature. Using the camera, TV monitors, and live video feeds, she pushed the technology to its limits. This lead to the creation of Organic Honey’s Visual Telepathy in 1972; the first performance to include video. Interior view of My New Theater I: Tap Dancing (1997), Pat Hearn Gallery, New York, 1997. Photo: Courtesy the Estate of Colin de Land © Joan Jonas : Artists Rights Society (ARS), New York : DACS, London. Installation of My New Theater I: Tap Dancing (1997), Pat Hearn Gallery, New York, 1997. Photo: Courtesy the Estate of Colin de Land © Joan Jonas : Artists Rights Society (ARS), New York : DACS, London. Jonas developed the My New Theater series in 1997 as a means to portray a sense of live performance to audiences, even when she wasn’t present. These boxes also appear in some of her larger installations and the videos in them are designed entirely for this format. To date she has built six of these wooden constructions, which house props, TV monitors and projections, forming what feels almost like one of her installations but in miniature. My New Theater I: Tap Dancing (1997) , for example, shows a projection of a tap dancer’s feet, alternating with clips of another dancer moving through poetic scenes. Placed before the projection are a series of images and objects which resemble small-scale models of the props you might see in one of Jonas’s live performances. Joan Jonas, Stream or River - Flight or Pattern 2016-17 © Joan Jonas : Artists Rights Society (ARS), New York : DACS, London. I like to draw the dog’s head over and over. I could draw it endlessly. Maybe this is sick, but I’m going to keep doing it. Jonas’s three dogs feature in a number of works either as a cameo appearance or as drawings. The presence of dogs in her work is symbolic of the animal helper common in ancient mythology and ritual. For Jonas, this ‘magical intrusion of the animal’ provides an added layer of meaning to her work. The relationship between animals and humans is very mysterious, and I think it’s very important, especially in this world right now, the planet we’re living on. Jonas explains that their appearance is usually spontaneous, such as Moving in Place (Dog Dance) (2002/2005) , where her dog Zina ran onto the scene of her performance and began nudging her to play with her and throw a ball. My dog is a character. She is a comedian and a natural performer. I never ask her; she just gravitates towards the action. It’s very strange; she somehow knows what to do. In her video Beautiful Dog (2014), however, Jonas’s poodle Ozu intentionally stars in the piece. Trotting along the beach with a GoPro camera attached to his collar, we see the world upside down through his back legs. The instinctual movement of the dog controls what the camera sees. This is a typical example of Jonas embracing accidents within her work. Joan Jonas, Reanimation © Joan Jonas : Artists Rights Society (ARS), New York : DACS, London. Whether it’s textures, light, sound or ideas, each of Jonas’s pieces is a multi-layered web of materials and meaning. 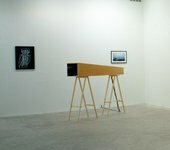 This approach can be clearly experienced through Jonas’s piece Reanimation (2010/2012/2013) which combines sounds, materials, drawings and video recordings to create an immersive space. As with many of Jonas’s works, Reanimation began as a lecture performance in 2010, within which she did a performative demonstration and showed some footage filmed in Norway. Over the course of the next three years the piece was redone in several variations. This process of development is key to Jonas’s work, with her pieces often incorporating elements of previous performances, drawings or props and costumes. So throughout her body of work you will find this principle of echoing and mirroring. Jonas focuses on the novel Under the Glacier by Halldór Laxness, though when she began working on the piece, she researched the subject (as she always does) by listening to the podcast Submarine Media: Sounding the Sea with Cyborg Anthropology by Stefan Helmreich, and reading the writings of underwater filmmaker Jean Painlevé. Intricately interwoven, the various voices transport the viewer deep into the world of nature and ice. Meanwhile Jonas places herself within this complex sensory space, smearing ink onto paper with ice cubes and standing in front of the projection to draw onto large sheets of paper. In another moment the bouncing light of crystals refracts onto footage of Norwegian countryside, accompanied by a soundtrack by jazz pianist Jason Moran. Joan Jonas, Stream or River, Flight or Pattern (2016 - 2017) © Joan Jonas : Artists Rights Society (ARS), New York : DACS, London. Jonas’s extensive travels function as a form of research, helping her to generate new ideas and source new materials to work with. Whether it is a series of animal masks purchased in Mexico or fairy tales from Iceland, the viewer will find a trail of references to the different parts of the world she has visited. Japan, Greece, Morocco, India, Germany, the Netherlands, Norway, Poland, Hungary, and Ireland all feature in various forms. In particularly her experience of the Noh and Kabuki theater in Japan as well as traditional rituals in Crete and the American Southwest were a key starting point for her mesmerising performances. Stream or River Flight or Pattern (2016/2017) features three videos which show diverse settings from Jonas’s travels; Venetian mosaics, a bird sanctuary in Singapore, a graveyard in Genoa, redwood forests around San Francisco, the landscape around Santander, and traffic in Vietnam.